Time for another challenge over at Crafty Creations Challenges. 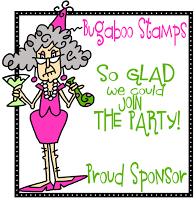 We are up to challenge #337 and our lovely sponsor this week is Bugaboo Stamps who is offering the prize of 4 Free Images. For my card I chose the image - Birthday Ewe Trio. I needed to make a birthday card for a colleague and this image seemed perfect to come from the team to him. I coloured the image with copics and then matted with cardstock. I have used some Bo Bunny spotted paper and added twine and a button.